Americans today see their pets as extended family members and are taking more of a parental role with their furry loved ones. This humanization of our pets has been instrumental in building the U.S. pet industry into the seventh largest retail industry in our country, reaching nearly $67 billion in spending last year. That means marketing to pet owners is a big deal, too. The fastest-growing groups of pet parents are empty nesting Boomers and Millennials. While today’s Millennials may be putting off having children due to college loans and lower starting salaries, they are sparing no expense when it comes to their pets. And empty nesting Baby Boomers see their pets as the new children in the home. These two groups combine to make up the largest percentage of the population with the money, time and emotional space to treat their pets as the kings and queens of the households. According to Mintel research, the growing trend toward humanizing pets has led to increased specialization of pet products and services. Pet owners aren’t just purchasing food, veterinary services, and toys. Many are utilizing pet psychologists, doggie spas and daycare for their pampered pets. They’re purchasing high-end natural foods, clothing from pet boutiques, and seeking out homeopathic treatments. Other pet services increasing in popularity include massage, portrait photography, pet behavioral consulting and mobile grooming. The attachment owners feel for their pets has also led to a significant rise in sales of products driven by technological advancements. In addition to webcams and smart feeders, 68% of pet parents are purchasing microchips for their fur babies. 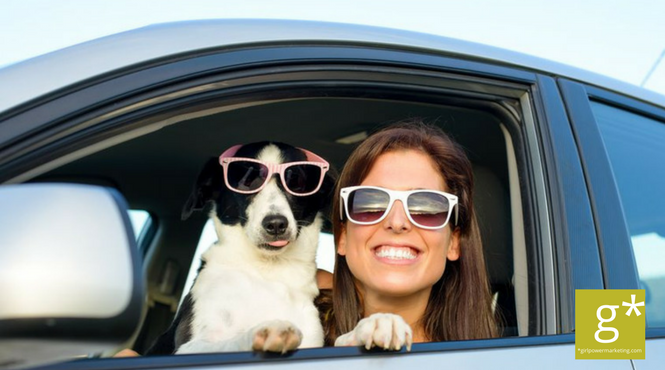 For today’s marketers, pets may be the ultimate influencers. Pet owners are no strangers to social media, with many having Instagram accounts for their pets and 65% sharing pet posts at least twice a week. Brands are also jumping on the bandwagon, with Jet Blue posting about Marnie the Dog and other brands using popular pet influencers to drive visibility and engagement. The biggest increase in participation is on Instagram, where brands are seeing up to 295% more comments on content relating to pets. Those who are smart about marketing to pet owners are working to cash in on this trend, with a combination of social media campaigns, content marketing, and witty Facebook Live and YouTube videos designed to touch emotions, build awareness and drive sales. Understanding your consumer is key to engaging them. And that’s what Girlpower Marketing specializes in. For more information on engagement strategies that will get your product or service noticed by today’s pet owners, give us a call.